Conceptualized Punk O Rama and found a home for Martin Streek on Saturday nights at Club 102--both shows still on air - which I am proud of. Was on air at Mojo from 2002 to 2003 as host of the mojo market close with Mike Stafford. Upon my difficult decision to say good bye to the greatest frequency in the global village, was inducted into the CFNY Hall of Fame. I have been managing money for people in the media and entertainment business, since 9/11. The market is a highly creative business, my clients are exceptionally creative folks and radio taught me invaluable life lessons. Music and Money do matter. Wolfgang was working as an Investment Advisor for RBC Dominion Securities. 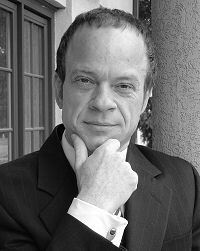 Wolfgang Klein can be seen frequently on Television, through his daily commentary on CP24, bi weekly on both Robtv and CBC Newsworld. Wolfgang brings a fresh, colourful and entertaining perspective on issues pertaining to the world of money, which is all good. I left RBC Dominion Securities to join Canaccord Capital. I am a daily guest on City Pulse 24 aka CP24 Mondays at 9:15 and 5, Tuesdays at 11:45 and 5, Wednesdays at 9:15 and 5, Thursdays at 11:45 and 5 and Fridays at 9:15 and 5. I provide fresh market insights, news and overviews of what happened and what could happen in the financial markets. I also appear bi-weekly on BNN and periodically on CBC. I manage money for individuals who are in the media and entertainment industry along with friends and small business owners. Wolfgang can now be heard as a daily guest on City Pulse 24 aka CP24 and Radio AM 1050 Mondays to Friday 9:15 am and 4:45 pm. Wolfgang provides fresh market insights, news and overviews of what happened and what could happen in the financial markets. He also appears periodically on BNN and CBC. He manages money for individuals who are in the media and entertainment industry, business executives and professionals along with friends and small business owners. Wolfgang is VP and Senior Investment Advisor at Canaccord Wealth Management .